- Seen in history - what happened in Greece is a perfect example of what is to happen with other Treasury Bonds - when the bubble bursts, most of the time, it's too late to act - Five past twelve to move out of Fixed interest instruments & financial instruments based on bonds (incl. TAK and other bank manufactured products) and into Real Assets (incl shares but excl. Real Estate and exl. financial shares, pension funds, (re)-insurance co's). This is a completely MANIPULATED market and will be the coffin of many Fortunes...Treasuries = Credit Default Swaps = Bank manufactured products = saving accounts = bank deposits,. What good does it do to be safe when on day 1001 you are slaughtered!?. Utility Index has been moved where it belongs! June 9, 2014: markets will continue to go up as long as THEY PRINT MONEY ! Nov 11: we shall see much higher markets. Oct 22: this is the 5th, most dramatic upleg but also the FINAL bull run. Jan 16, 2016: support (520) is holding..
Jan 19, 2017: Utilities however will probably start a fresh upleg as interest rates come down again. July 13: and a BUY signal....expect higher! Feb 5 - Mar 25: STOP LOSS..expect lower. May 10: Expect a LOWER index/stocks + Higher interest rates! Aug 31: Central Banks will do whatever they can in order to keep interest rates low! Sep 20: KEY BEARISH reversal on short Candle !?!?!? Oct 5 - Feb 25, 2019: Resistant Utility Index proofs the Bull market is not over yet. Feb 10, 2015: NEW ALL TIME HIGH. Unbelievable dangerous! 6 August - Sep 28 - Oct 28 - Nov 19 - Dec 17: more TOP building. March 1- April 29 - May 25 - July 11: NO DOUBT that we're gonna see NEGATIVE INTEREST RATES in the USA. Jan 20 - Feb 22, 2017: the trend is reversing DOWN...mind the bearish wedge. Feb 11 - June 19: STOP LOSS = higher interest rates and confirmation of 35 year old top. Aug 31 - Sep 20: Central Banks will do the impossible to keep interest rates low! Oct 5 - Nov 26 - Dec 21: Strong Support Level. Mar 1 - Apr 29 - May 25 - July 11 - Aug 31: Brace for NEGATIVE interest rates !! Jan 20, 2017: but the trend is reversing and better brace for HIGHER interest rates. Feb 22: ?? ?...what will happen AFTER the consolidation?? March 16: Interest Rates are breaking UP....out of the bullish wedge. July 24 - Dec 23: trend interest rates is still BEARISH! Jan 17, 2018: reversal is confirmed once 3.05% is broken and holds. Feb 11 - June 19 - Aug 31: 3.05% is broken and HOLDS! Sep 20: Interest Rates are bouncing into heavy resistance. Oct 5 - Jan 30, 2019: Strong Resistance - watch out if the RED trendline is broken. April 1: lower interest rates we shall see. 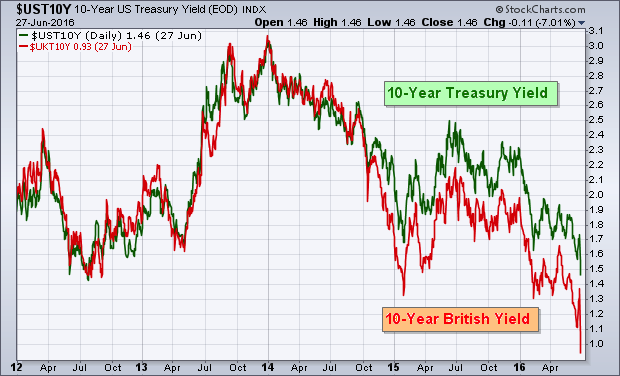 ʘ ʘ ʘ 10 year US Treasuries Yield - the Bond market is finally turning Bearish and one must avoid Bonds for the time being. Jan 17, 2018: The 10 year yield has already broken the downtrend and the 2.58% marks a 10 year high. Feb 11 - June 19 - Aug 31: confirmation of BREAKOUT = expect higher interest rates. Oct 5 - Nov 26: BREAKOUT!? ʘ ʘ ʘ - Municipal bonds now also bought by Central Banks. The Federal Reserve, along with the Federal Deposit Insurance Corporation and the Office of the Comptroller of the Currency, just changed the liquidity requirements for the nation's largest banks. Municipal bonds, long considered safe liquid investments, have been eliminated from the list of high-quality liquid collateral. assets. That means banks that are the largest holders will have to dump them in favor of the Treasuries and corporate bonds that do satisfy the requirement. March 2016: Less than a week after the ECB’s announcement, and months before it is to actually buy any bonds, a new record for a euro-denominated corporate bond issue was set on Wednesday when brewer Anheuser-Busch InBev said it was seeking to raise 13.25 billion euros ($14.9 billion). “In our view this highlights the current positive backdrop for primary issuance induced by the ECB’s new easing measures” and particularly the new corporate bond program, credit analysts at Dutch bank ING wrote in a note to clients. The corporate debt market has already benefited indirectly as ECB purchases of government bonds have pushed investors into the corporate market, lowering borrowing rates. In addition to the corporate bond purchases, the ECB also announced earlier this month a program to effectively pay banks if they step up their lending. April 26: Municipalities are going belly up but bonds are at an all time high! ?...something wrong here? Dec 17: looks like we finally have this HISTORIC TOP of the 35 year cycle. Jan 26: 2016: HISTORIC TOP of the 35 year cycle. Mar 1 - Apr 29 - May 25 - July 11 - Aug 31: we are about to see NEGATIVE interest rates. May 4 - May 30: seems we will see new upleg?! July 24 - Aug 17 - Sep 26 - Oct 28 - Nov 23 - Dec 23 : No new upleg but more top formation. Jan 30 - Feb 25, 2019: ??? - back to an historic TOP!? April 1: yes...up to the historic top! 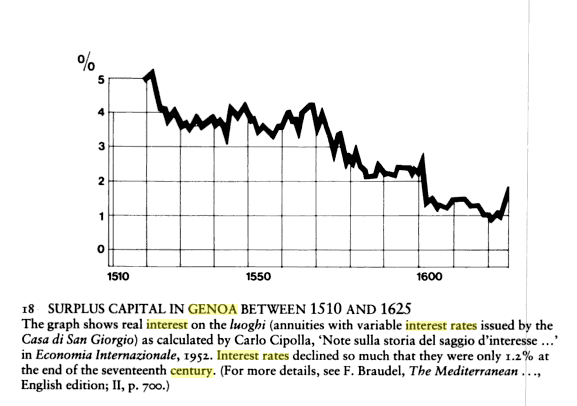 Interest Rates have never so low since the 15th Century. To the left is the law of supply and demand of Money...or how the price of Money (Interest) is regulated in an open system. When the money supply goes up, the interest rates should come down. When the money supply comes down, the interest rates should rise. This is the section where so far we have been completely wrong (at least for the USA - but also for the EU where the FED and the ECB have been able to avoid the worst) because so far no crash happened. This does not mean however that a CRASH can happen any time. Having said this, the TIMING is wrong..the technicals and the fundamentals however are not ! 10 Year Treasury Bonds in Gold ---A CRASH IT IS ! ...80% loss since 2000 or 10% loss each yearly. The downtrend is about to be resumed in September 2017. This is a CLEAR almost SPOTLESS downtrend...or Gold becomes the ultimate Barbaric money and Bonds and Treasuries worthless. Merlin is active in the Bond market...and what a wonderful job he's doing... municipalities go broke but their bonds go up! As long as the PF chart shows no Trend Reversal one should not touch Bonds and Treasuries. Not even with a 10 yard stick. Bonds are certificates of guaranteed confiscation (Ludwig von Mises) and the safest way to loose your savings. The first phase of the banking crisis has only wiped out bank equities, the second phase is to whipe out deposits but the last phase will wipe out bondholders, bank equities, deposits,. 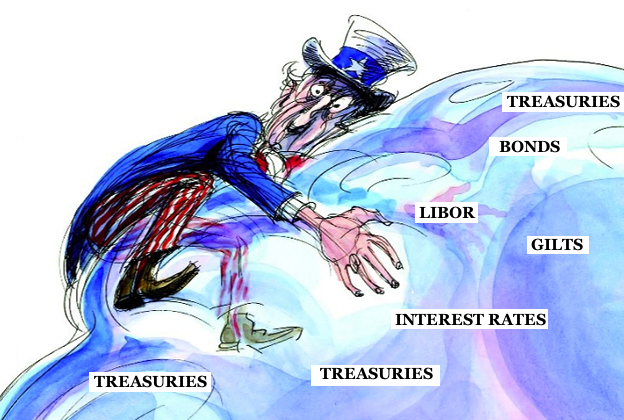 ...once the Bond market wakes up, it will be GAME OVER! The FED, the ECB, the BoJ and the Bank of England have become the largest single buyer of debt. Quantitative Easing it is called but monetary inflation it is....such a policy always results in worthless money, worthless bonds and higher interest rates. Interest rates will rise AND so will GOLD! Remember the Top for Bonds has been seen last year and cycles are 37 years long...and Bonds will indicate the beginning of Hyperinflation. Interest Rate cycles are 60-70 years long: 30-35 years up and 30-35 years down. Nominal Interest Rates are at record lows and Real Interest Rates are NEGATIVE and will be pushed deeper into the Negative (June 2016)..NOT logic is that there is a disconnect with the Money Supply. 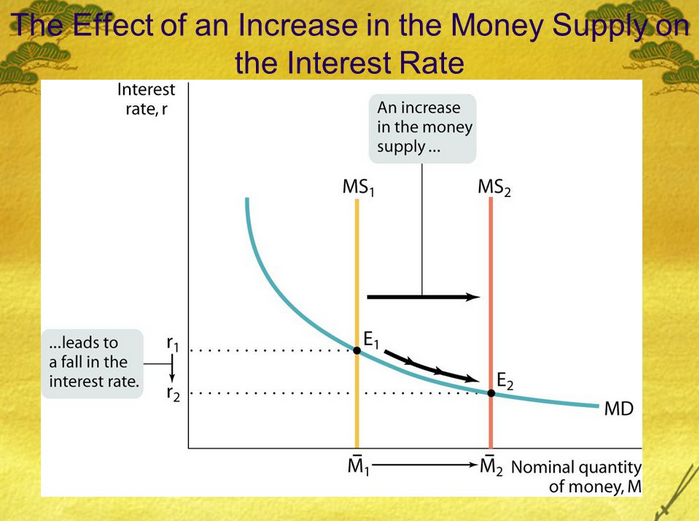 Negative Nominal Interest Rates actually REDUCE the Money Supply and hereby increases its intrinsic value. The PF and Long term candle charts below are of capital importance as well as the 3% threshold ! The higher the debt, the lower the critical level; for Japan the critical level is 1%. Hyperinflation occurs when a country’s bond market breaks. In other words, the sovereign nation is no longer able to fund itself. Its bonds fall (yields rise) to the point where the government has to print money or default. Rising interest rates cause the interest payments to consume too much of the overall budget. The government or central bank then begins to print money to fund its deficit. Then the citizens start to consume, knowing the currency is rapidly losing value. Demand has nothing to do with the cause or the onset of hyperinflation. Why didn't Japan have hyperinflation in the 1990s? It didn't have to monetize its debt. It had the internal savings to be able to finance its budget. The same thing is true with the United States in the 1930s. Even though we devalued the currency, the bond market remained strong into the early 1940s, thus preventing runaway inflation. The catalyst for severe inflation globally is the breaking of many bond markets. The UK, Japan and the US won’t be able to finance their budget gaps without monetization. The budget deficits are now larger and they come at a time of reduced global liquidity and reduced tax revenues. Global monetization will lead to severe inflation and hyperinflation. ʘ ʘ ʘ - TBT is an instrument to short Bonds. 6 August - Sep 28 - Oct 28 - Nov 19 - Dec 17: BOTTOM..
May 4 - May 30 - July 24 - Aug 17 - Sep 26 - Oct 28 - Nov 23 - Dec 23: ??? BOTTOM?? Feb 11 - May 14 - Aug 31 - Oct 5: BREAKOUT. In a system of Real Money (Gold and Silver) it is the Money which regulates the economic activity and the general level of interest rates. World Bond markets move in symphony. We have GLOBAL MARKETS. What happens in Greece is the direct reflection of what happens in the USA and the UK is a precursor of what is to happen in the rest of the world. History is being written. Bringing down interest rates and keeping them low is EXACTLY the opposite of what should be done. History shows over and over again that the authorities are champions for doing the wrong thing at the right time. Ludwig Von Mises explains clearly that one must INCREASE interest rates to INCREASE SAVINGS which are to be used for fundamentally sound INVESTMENTS. Authorities are doing exactly the opposite: low interest rates increased consumption and created the real estate bubble (dead capital) hereby debasing the savings of the Baby boomers. Today Authorities do all they possibly can to keep the rates down and the economy alive. It goes that far that the FED buys US treasuries as soon as other buyers fail. Low interest rates keep the rate of Foreclosures low and troubled Credit Card companies alive. However, as explained by Ludwig von Mises, at a certain point the market forces take the final decision. The longer interest rates are suppressed, the stronger they will veer up once time has come. Chart below: European bonds have also reversed trend. The earlier break down resulted in a false break and will now built a double Top. Authorities are injecting Trillions (Quantitative Easing) in the economy in order to keep it alive. We know this won't - in the medium term run - save the system from collapsing. It NEVER did in the past and it will not today. Only after the misallocated funds have been cleansed out of the system a fresh boom can be initiated! By artificially lowering interest rates, the authorities are doing nothing more than increasing the misallocation of funds.. In the long run, interest rates rise as a consequence of the inflationary policies of the 'authorities and banks' and the latter adjust what we call 'the official interest rate' to the conditions of the market.